Guest blogger Janelle Mowery, welcome to the Yielded Quill! I love attending conferences. They’re like a culmination of all the hard work I’ve put into my writing. Okay, scratch that. A CONTRACT is the culmination. Conferences are the reward I give myself for all my hard work. I also love object lessons, so I tried to come up with a visual aid that might come close to explaining my feelings for the whole publishing realm and the place conferences hold in that vast territory. Sorry, but a kite was the best I could do. Kites were made to fly. They come in all shapes and sizes, colors and designs, but they’re all made to do the same thing…get up there where the wind will help them fulfill their goal. The way they whirl around in the sky, they almost paint a picture. Most kites have tails. Some are longer than others but they still serve the same purpose. What might that purpose be? Well, a tail helps the kite fly through the air. It changes how the wind moves around the kite, keeps the kite pointed into the air, and gives it balance. Without a tail, a kite likes to roll and dive…and crash. Did you also know that without the attached tethering string, the kite, no matter how big or bright, is nearly worthless? Writers are very much like kites. We love to soar. We also paint pictures…with words. And we have tales. Oh, do we have tales. Some are longer than others, some a bit more colorful, but if you think about it, our tales serve the same purpose. I’m not talking about the stories we create. The tales I refer to are the stories we have, the steps we’ve taken, on our journey to publication. I have several. Most have taken place at ACFW conferences. Let’s see, I can recall my bunkmate telling me to stop practicing my pitch and go to sleep, then during the night silently screaming for me to wake up. I remember two authors who became highlights of conferences because of their encouragement, one telling me my writing was already publishable and the other cheering me on and working me up into such confidence I’m fairly certain the editor wanted to run for dear life from the wild-eyed writer sitting in front of her. And the friendships. Oh, the friendships, both new and old. I have so many wonderful memories of both. But most of all, I can clearly see the steps God took me through to get me to where I am now, a published author. Never forget to examine your tails/tales. They’ll keep you pointed into the air, moving around and changing directions, and give you a sense of balance when the rest of the world seems off kilter. As my co-author and good friend Lisa Ludwig does such a good job of reminding us, don’t be so focused on the goal that you forget to enjoy the journey. 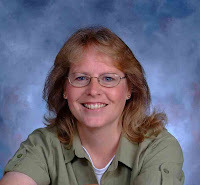 Janelle Mowery is a member of American Christian Fiction Writers and an active member of an ACFW critique group. 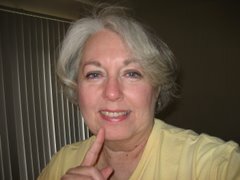 She signed her first contract with Barbour Publishing in their Heartsong Presents Mysteries! line in 2006. WHERE THE TRUTH LIES, a cozy mystery co-authored with Elizabeth Ludwig, released in the spring of 2008. Love it, Janelle. Very nice. 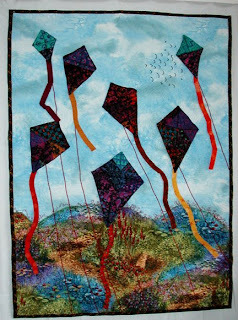 What a great idea using kites to explain your idea, Janelle. I wonder, though, if my string might be a little too long as I swear I have hit a powerline or two in my writing career. Or at least I've been singed once or twice. But God is always at the end of the string to pull me back before those second and third degree burns. YOU'VE hit lines and been singed? Why do you think I've got to spend so much time straightening my hair? Underneath the hour of use of a straightening rod lies hair that looks like I've stuck my finger in a socket and couldn't figure out how to pull it out. Yep, 'powerline' is my nickname. LOL. But like you pointed out...God never lets go. Sometimes God lets out a little too much string! I used to think He allowed these times of frantic dipping and swaying to test us. These days I'm more of the opinion he does it to develop our confidence, in the same way a mother eagle repeatedly drops her young from great heights before sweeping down to save them. Wow, Janelle. You have us waxing very poetic today. Wonderful analogy! Great analogy, Janelle. Made me think! I love the reminder that we need to pay attention to the journey, not just the goal. Great words to think about, Janelle!